Well, my foot is feeling better than it did over the weekend. Whatever is causing this swelling, it looks like it will go away much faster than last year’s gout. Now when it comes to false prophets, there are plenty in our time. 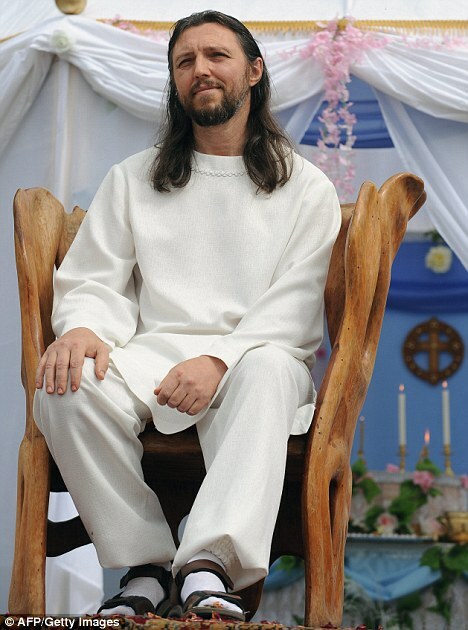 It looks like there is another one in Siberia — a former policeman named Sergei Torop, who decided in 1991 that he is a reincarnated Jesus, and changed his name to Vissarion. OK, he looks like Jesus, all right; if I was making a movie about the New Testament, I’d consider casting him in the lead role. But can he do miracles? According to the webpages I saw, his followers have built a village in Siberia named Petropavlovka. I haven’t been able to find it on a map, but judging from the pictures I saw of it, with mountains in the background, I’m guessing it’s just east of the Urals. I also watched a few videos, none of them in English, though. Over the years I have learned that some languages make everyone sound polite, like Swedish, while others make you sound authoritative. Russian is an example of the latter, but somehow Vissarion comes across sounding gentle while speaking Russian; no wonder he attracts a crowd over there. Oh, and one other concern. Vissarion is not the first Siberian holy man. A century ago, another one came out of Siberia and gained control over Tsar Nicholas II and his family — Rasputin. Here’s hoping that history won’t repeat itself. Anyway, here is the article where I heard about him; I have already printed up a copy to show my friends and co-workers tomorrow. I know it’s a bad pun, but it’s appropriate for how I felt this weekend. Last Friday afternoon my left foot started to swell up. It was only a nuisance on Friday, but on Saturday it was painful just to walk or put on my shoes, and it kept me awake for much of the night. It’s not so bad now, so I’m hoping I’m on the mend. I had a problem with gout in my left foot twice in the past (February 2004, September 2008), but then the swelling was in the ankle; this time it is in front, near my big toe. Consequently I stayed inside for most of the weekend. I mowed the front yard last Thursday, and I would have preferred to mow the back yard today, because the weather was perfect for it, at 72 degrees and sunny. Leive and I did go to the Sunday night meeting at my pastor’s house, and I learned that some other men in the congregation are having foot problems. Who’d have thought that would be contagious? Speaking of Leive, she came back from the ladies’ retreat yesterday afternoon, at 3:45 PM. Although Brin-Brin the parrot prefers Leive’s company to mine, we managed a truce of sorts while Leive was away. It turns out they were in a remote part of the mountains; definitely a dead zone, because Leive’s cell phone didn’t work the one time I tried calling her. The nearest outpost of civilization was Ravenna, KY, so I’m guessing they were in the part of Daniel Boone National Forest that runs through Estill County. At first all she was willing to talk about was that they had plenty of animals running around, and they saw a very fancy stone furnace. I’m getting more out of her bit by bit; it sounds like they had a good bonding experience, anyway. In case you haven’t heard by now, last Friday it was reported that the head of the Federal Reserve Board, Ben Bernanke, became a victim of identity theft. His wife’s purse was left behind in a Starbuck’s, and somebody tried to use the checks it contained. Luckily for him, the authorities caught the thief, something which hardly ever happens these days, where “the silent crime” is concerned. In previous messages I told you about Leive and I getting involved in Pre-Paid Legal Services. Well, among other things, we offer identity theft protection and restoration for $9.95 to $12.95 a month, depending on where you live. Mr. Bernanke controls our nation’s money supply, and is probably the most powerful non-elected official in our government, but even he can be an ID theft victim. If his experience is anything like what happens to common folk like us, it will take about 600 hours of his time to restore his credit and good name. That’s like working a fulltime job for almost four months! To protect your identity, click on the link below, and then click again where it says, “ENROLL NOW”. I hope to hear from you soon. And now here’s another link to a story about strange plants and animals from Southeast Asia. Well, actually it’s in India, but in the easternmost state, Assam, and the main ethnic group in the area, the Assamese, are related to the Thais, so this is Southeast Asia if you fudge on the region’s borders. Anyway, there’s a place in Assam called Cherrapungee, where the rainfall is so great that a local rubber tree grows a second set of roots, from the middle of its trunk, to give it a firmer footing against erosion. These allow it to grow in unlikely places, like on top of a boulder, or even in the middle of a stream. And in a place as wet as Cherrapungee, you know there will be a lot of streams. A local tribe, the War-Khasis, will train the roots of trees growing on riverbanks to go into the ground on the other side, and when the roots become established, they weave them into suspension bridges. The result is more sturdy than you think; as long as the tree is alive and growing, the bridge will get stronger. Some can carry up to fifty people at a time, and there is at least one case of a double-decker bridge! And while it takes ten to fifteen years to grow a root bridge, it is estimated that some have been in use for five hundred years. Thus, in that climate, they probably last longer than a conventional bridge built of wood, stone or metal. I’m reminded of a few science fiction stories where people grew their architecture instead of building it, like the home trees in Alan Dean Foster’s “Midworld.” Well, here is yet another example of truth being at least as strange as fiction! This afternoon Leive will go on a retreat with the ladies of our church. Don’t worry, the place is only 30-40 miles away, and she should be back tomorrow. Hopefully Brin-Brin and I can be friends while she is away. This month has been a great one for Pre-Paid Legal Services. They’re running various specials, to sign up lots of new folks before a new marketing campaign is unveiled next month. The best special is for our most expensive membership package, the Fast Start Builder. Normally that costs $249 to get started, but for August only it is $79 — a 69% discount! Contact me or go on my Pre-Paid Legal website to learn what’s in it. Before composing this message, I checked my stats with Pre-Paid Legal, and found that I had just been promoted from the rank of Manager (which I reached in May) to Director. Yay, there are only two other directors in Lexington! To everyone on my team, I want to tell them, “Way to go!” Do you remember the final scene in “Willy Wonka and the Chocolate Factory,” where the characters are in an elevator that rises so fast, it crashes through the ceiling of the building and goes flying across the city? That’s what it feels like. This week I saw the ceiling rapidly approaching, and now I’m there. No money yet to go with the promotion, though; hopefully the company is just behind on the paperwork, with all that’s happening as the month draws to a close. Which brings me to the reason why I’m telling my readers all this. If I can sign up one more member or associate before the month ends (that’s between now and Monday), my bonuses will be doubled. So come and check it out, through the links below. If Pre-Paid Legal is for you, I’d love to have you on my team! Now Who Will Represent the Seven Deadly Sins? This morning I woke up to the clock radio announcing Senator Edward (Teddy) Kennedy’s death. No real surprise there, since he had been battling cancer for fifteen months, and recently called for his replacement to be elected or chosen quickly. It also wasn’t a surprise that hardly anything else was discussed in the news today. Finally, the Democrats are using his death to gain enough sympathy to get the proposed health care bill passed; Franjo Tudjman, the first president of Croatia, would be proud. I did find it irksome that everyone, including conservatives, was praising him for his long service in the Senate. They called him the “Liberal Lion,” praised his social legislation, said you could count on him for bipartisan support of a bill, and so on. Sorry, but from my distant vantage point, I didn’t see that. I saw America’s sleaziest senator, a walking argument for term limitation. He certainly had little in common with his late brothers, Jack and Bobby. In fact, the Democratic Party has shifted so far to the left in recent years, that if Jack or Bobby were alive, I’d expect them to be Republicans by now. And I don’t think he ever saw a spending bill he didn’t like (except those involving the military), or a person in need of help that he couldn’t raise the taxes of. Remember this speech from JFK, about fighting for freedom? That sure doesn’t sound like something that Teddy, or any other modern-day Democrat, would say today. Finally, there are the personal issues. Honestly, what is it with Massachusetts voters, that they keep sending inarticulate congressmen back to Capitol Hill to represent them, again and again? To the rest of the nation, slobbering Barney Frank is a sick joke, because he won’t take the marbles out of his mouth when he talks. And Teddy was so drunk that he couldn’t be understood half of the time. Since the beginning of the year, as time permits, I have been working on the fifth paper for my North American history series, covering the years from 1933 to the present. Coincidentally, I am now up to JFK’s presidency, so I will be writing about the Kennedies over the next few days. In Teddy’s case, at a minimum, I will be writing about how Chappaquiddick kept him from becoming president, and how the immigration bill he co-sponsored in 1965 led to the current situation, with most of our immigrants now coming from Asia and Latin America. Of course, that comment is now out of date, so it has been removed. Anybody know who can I find to take the senator’s place? Is This an Eagle, an Owl, or a Cat? Now a pitcher plant has been discovered in the Philippines, big enough to digest rats that may drown in its water trap. Their leaves collect and hold rain water, much like bromeliads; animals fall into the leaf traps, drown before they can get out, and are digested at leisure by the plant. Pitcher plants are fairly common, especially in Indonesia, but all the ones I had heard of so far were only big enough to trap and digest insects. This one has only been spotted on one mountain, on the island of Palawan. Apparently some plants half the size were seen on Borneo that contained the remains of mice, so that’s why the scientists believe this one could handle a rat.